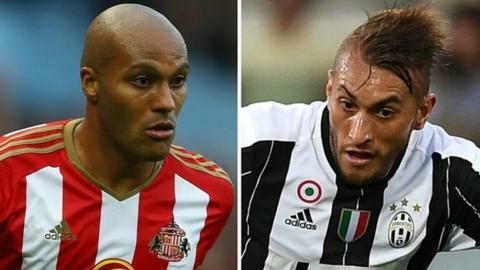 Watford have completed the double signing of Juventus midfielder Roberto Pereyra and Sunderland's Younes Kaboul. Kaboul, 30, has joined from Sunderland for an undisclosed fee on a three-year deal after asking for a move away from the north-east for personal reasons. Pereyra, 25, becomes the Hornets' record signing on a five-year contract. Watford's previous record transfer was the £12.5m they paid Granada for striker Isaac Success in July. The fee for Pereyra has not yet been revealed. Before joining Juventus, initially on loan, in 2014, Pereyra played for Udinese, the Italian club owned by the Pozzo family, who also own Watford. He has 10 full caps for Argentina and was part of their 2015 Copa America squad. His transfer is subject to Watford obtaining a work permit for him.